Natural health manifests itself in the physical appearance of your dog. A sleek, shiny coat, bright eyes and clean airways all demonstrate the effectiveness of your dog’s immune system. Through the use of 8 active nutraceuticals, Immune Aid provides support to the normal immune system of the dog to deal with the presence of foreign materials that can be harmful to health and physical condition. These antagonists are found in feeds and the environment and trigger the natural self-defence mechanism of the dog to neutralise any possible harmful effects. Helps maintain the dogs’ natural immune response to the presence of environmental and/or feed derived foreign materials, which can be harmful to both health and physical condition. Helps maintain healthy internal mucous membranes. Contains 8 active nutraceuticals, including: concentrated yeast and oat derived oligosaccharides, glutamine, MSM, oat bran concentrated soluble fibres and a blend of galactolipid emulsifiers, tocotrienol antioxidants, beta glucans and phospholipids. Contains the Oatinol Delivery System to maintain a healthy digestive tract and a high rate of absorption of essential active ingredients, vitamins and trace elements. Is a 100% Non GM, soya free formulation. Is manufactured as very palatable and easily digested 2mm pellets; perfect for mixing with dogs' normal feed. Is quick and easy to feed. Through the addition of the following specific active ingredients, X-Lam Aid Pellets provides a complementary nutritional support for all horses and ponies. Concentrated Yeast Derived Oligosaccharides Oligosaccharides provide a feed source for beneficial bacteria and support the natural expulsion of antagonists found in feed and the environment. Oat Bran Concentrated Soluble Fibres Soluble Fibres are non-digestible sugars that can support natural self defence mechanisms in the bloodstream. Glutamine Glutamine is a protein derived amino acid that supports the natural immune response and is essential for gut wall integrity. MSM (Methylsulfonylmethane) MSM is essential for healthy connective tissue, joint function, cell replacement, enzyme activity as well as the immune system. For all of the above active ingredients to be utilised, they have to be absorbed from the horses’ digestive tract. Oatinol supplies natural antioxidants, polar lipids, beta glucans and galactolipid emulsifiers, required to maintain gut cell integrity, maintain the lining of the gut, support the immune system and aid the absorption of active ingredients, vitamins and trace elements.into and out of cells. Oatinol - Galactolipid Natural Emulsifiers Galactolipids are a combination of sugar and fat molecules that help establish the perfect medium for enzyme activity in the gut to absorb feed components. Tocotrienol Antioxidants Tocotrienol antioxidants are found naturally in oat bran. This tocotrienol form of vitamin E is 40 to 60 times more readily recycled in membrane systems and supports tissue integrity. Beta Glucans Beta glucans provide nourishment for beneficial fibre degrading microbes and helps maintain a high level of natural immunity. Oatinol - Polar Lipids Polar lipids are found in high concentrations in cell membranes and are essential for tissue integrity and the controlled passage of materials into and out of cells. 1. Simply mix with the dogs’ normal feed. 2. 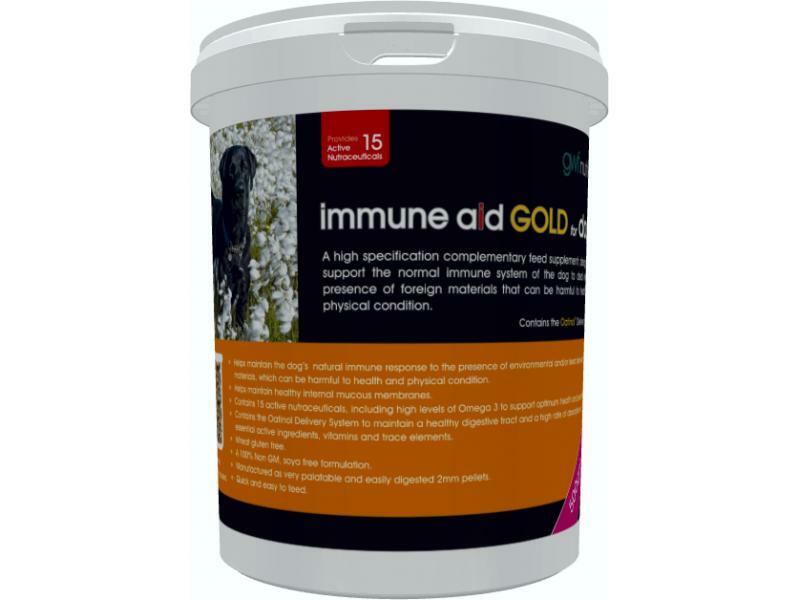 Immune Aid for Dogs can be fed to all dogs, regardless of age or level of exercise. Below are some recent questions we've received regarding GWF Nutrition Immune Aid for Dogs, including answers from our team. I am afraid I am unable to look at the current stock expiry but there is usually a long expiry date of 2 years from date of manufacture for products like this.